Since I've been a stay at home mom I've been doing a lot more cooking from scratch for my family. Not only is it better for them and saves us money in the long run, I also enjoy providing meals that I made for them myself instead of out of a box. One of the things that's always held me back a little bit is the fear of cutting myself when slicing foods like potatoes and tomatoes into slices. A lot of times I end up with a big end chunk because I worry so much about catching my fingers with the knife. After having actually done it a few times I've had just completely stopped cutting the last few slices. The other thing I've never been good at that I've seen people do is cutting foods they are holding in their hands. Again - afraid I will cut myself. Now that I have a pair of Stark Safe Cut Gloves I don't have to worry or be afraid anymore! 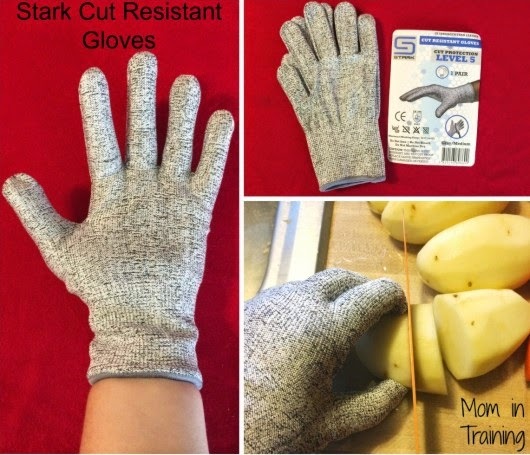 I simply slip on my gloves and start cutting my fruits and veggies without any worry of accidentally nicking my hand or fingers. I'm an average sized woman and the medium gloves fit me perfectly. Not too big to where they were in the way and not too snugly to where they were uncomfortable to wear. I really like that they are easy to use and also easy to wash. Depending on what I'm cutting I either hand wash them or I just toss them in with the rest of my laundry if they need an extra good cleaning. I then lay them out to dry after and they are good to go for my next use. Disclosure: I received one or more of the products mentioned above for free using Tomoson.com. Regardless, I only recommend products or services I use personally and believe will be good for my readers.